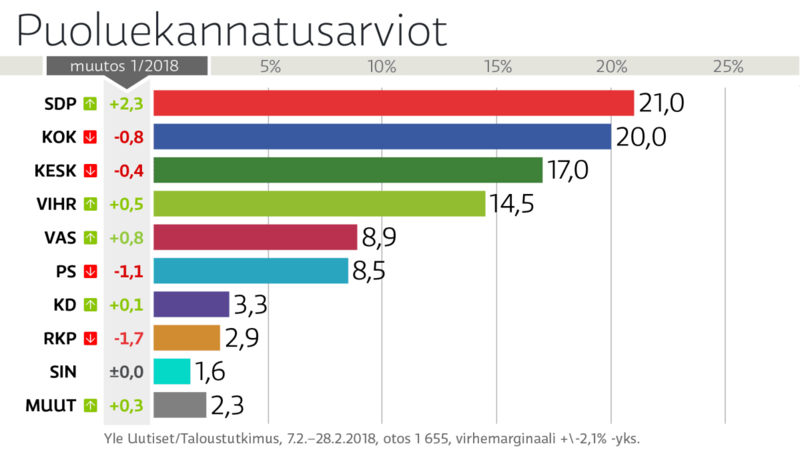 The biggest opposition party in Finland, the Social Democrats (SDP), moves into the lead in an opinion poll for the first time since February 2017 thanks to today’s survey from Taloustutkimus for national broadcaster YLE. With an uptick of 2.3 points compared to the February YLE poll, the SDP are above 20 per cent of voting intentions for only the second time in a year. This advance comes alongside small drops for both of the main governing parties, the conservatives of the National Coalition Party (KOK) and the centrists of KESK (see chart below). Public dislike of the centre-right government’s controversial labour market, health and social care reforms may well be driving the SDP’s gains; analysts suggest debate around the issues is reinforcing traditional right-left divides at the particular expense of the Centre Party. In another poll published earlier this week, by Tietoykkonen, the SDP is within a point of the KOK. Apart from that difference at the top of the rankings, the order of the parties is the same in Tietoykkonen’s poll as in that from YLE. In both surveys, the populist Finns Party (PS) is struggling behind the Green League (VIHR) and the Left Alliance (VAS) with less than 9 per cent. This is a far cry from the Finns’ third place and 17.7 per cent at the last General Election – clearly the party is still suffering the consequences of last year’s parliamentary split. Blue Reform (SIN), the splinter part of the Finns that continues in the coalition government under a new name, still lacks credibility with the voters, polling either side of 2 per cent in these surveys. A curiosity of the today’s Taloustutkimus/YLE poll is relatively large drop in support for the minority Swedish party the RKP, normally rock steady at between 4 and 5 per cent. The pollster has little explanation other than to say that the change is within the ‘margin of error’ of its sample. Fieldwork: 07.02-28.02.2018. Published: 02.03.2018. Respondents: 1655. Methodology: Telephone poll, weighted for past voting. Media partner: YLE Uutiset. Full report here. Fieldwork: 14.02-26.02.2018. Published: 27.02.2018. Respondents: 1142. Methodology: Mixed telephone and online poll, weighted for past voting. Media partner: Iltalehti. Full report here.